Trail network visits the Stone Mountain summit as well as waterfalls, trout streams, historic homestead and dramatic overlooks. Rugged terrain can offer hiking challenges, and equestrians enjoy a five-mile trail. Location: The trail begins at the backpack parking area for the Widows Creek Trail. The trail forks to the right at the backpack sites and continues for another 5.5 miles to the Devil's Garden Overlook on the Blue Ridge Parkway. All backpackers must register and pay at the backpack parking area before camping overnight. 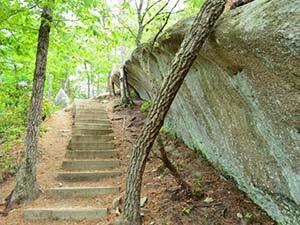 This 4.5 mile trail takes you across the summit of Stone Mountain, by the Hutchinson Homestead and a 200 foot waterfall. Hikers can choose to go to the waterfall or the summit and back without having to do the entire loop. The park's TRACK Trail is located on a portion of the trail from the Lower Trailhead parking lot to the Hutchison Homestead. 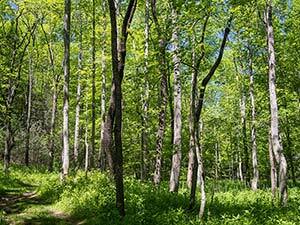 The trail follows Widow's Creek for 2.5 miles to the different backpack sites and stops. To view Widow's Creek Falls, park just beyond the Widow's Creek bridge and walk a short distance upstream. The trail provides views of the Blue Ridge Mountain escarpment. The ridges dividing three watersheds - Garden Creek, Widow's Creek and Bullhead Creek - can also be seen from atop Wolf Rock. Signs of old field succession are evident along the trail as it leads through areas which are predominantly pine, then mixed pine-hardwood and finally mature hardwood. Family & Group Campgrounds remain open after hours via the Royal Camp Ln Road. 8am - 5pm daily, except closed weekends December - February. Year-round, from 7am until park closes. Shelters close 30 minutes before park closes. Exhibits: open during park office hours. Homestead site: open weekends, May through October. Visitors are welcome to walk the homestead site grounds when the site is not open. Garden Creek Baptist Church historic site: services are held at 9am every Sunday, May - October and first Sunday, November - April. Visitors are welcome to walk the church grounds when the church is closed.